How do I get last vendor price to update? I may have missed this the whole time while using Acumatica. If a price is changed (+/-) on the PO receipt screen PO302000 during a receipt shouldn't the last vendor price update? The last cost seems to update, but when making a new PO the last vendor price is used, not the last cost? Could someone explain this, am i missing a setting? Do i have to make a new Vendor Price every time a price is changed? 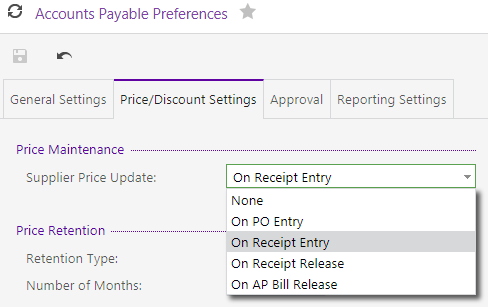 You need to check AP Preferences for when Last Price is updated. There it is, thank you. I guess vendor price and cost should be different when utilizing landed cost.